I've added two new small models to my fleet. Details about the whole current and past fleet can be found here. I was digging through a box of spare parts, and found some leftover BT-20 nose cones. My last BT-20 rocket, the Estes Hi Flier (see below) was lost long ago. BT-20 is just the right diameter to hold a standard A, B or C 18mm model rocket motor, and a rocket which uses that tube as a body tube is known as minimum diameter - it's only as fat as it needs to be to accommodate the motor. Because of that, rockets of this type tend to be much lighter and have less drag, so they can indeed fly very high. I like big rockets just as much as the next guy, but I felt inspired to use these parts, so I whipped up this design. Flechette (French for "Dart") is a two-stage rocket that may top 2,300 feet on two C6 motors. That makes it quite a performer for less than six dollars. The finished version will carry a small payload - the Perfectflite FireFly altimeter. For an upcoming project for this blog, I need some vehicles I can build quickly and cheaply, fly repeatedly, and easily replace if they get lost or damaged, and Flechette fits the bill. The prototype was built with leftover parts and has no payload - it's just a sport model that goes up and (presumably) comes down. I built it a day after making the design, with the intention of testing the method I came up with for coupling the booster to the main stage - or sustainer. Since it was cheap and didn't take ages to build, I'm OK with losing it, as long as it works. I had to miss the last launch, so as of this writing, Flechette has not flown yet, but I have acquired the parts to build 6-10 of them, including the payloads. Even without a booster stage, the rocket will fly 1,500 feet and still fulfill the purposes of the upcoming project. And I like the little sucker - reminds me of a tiny sounding rocket. If you've read the My Fleet of Rockets page before, or if you scroll to the bottom, you'll see that one of the first model rockets I owned - and lost - was the Estes Athena, a simple white and blue Ready-To-Fly rocket, which flies amazingly high on C6 motors. Before I was really bitten by the rocketry bug, I had flown a few with my friend Chad, and picked up some RTF models on deep discount at Michael's Crafts. While I really prefer to build rockets these days, I was sad to lose the Athena. Of the various rather similar RTF Estes rockets you can buy, I guess it was a favorite. It's fun and easy - pop in a motor and launch. RTF rockets are also great for doing quick demo launches for kids and non-rocketry friends you're trying to convert to the hobby. I won a new one after completing an online survey by the MIT Rocket Team, and picked it up when I took a tour of their rocket lab. Other winners - one from Alabama and one from Wales - received MIT Rocket Team mission patches. For a long time, I've had in the back of my mind that I should write a "Where To Buy Rocket Stuff" post, but have never gotten around to it. Well, there are a lot of places to get stuff. Tons of great online vendors, some brick-and-mortar chain stores which tend to carry rocketry supplies, etc. And a post like that would tend to be 1) very long, and 2) incomplete. But I think I'll have an occasionally-recurring "Featured Vendor" series. As this blog was, at the beginning, a venue for me to share what I was learning about rocketry as I went along, so that other beginners could pick up some tips, I think as I come across good suppliers, it might be helpful for rocket n00bs if I share that information. Of course, I love JonRocket, and have talked about them multiple times here. And I turn to them often before looking elsewhere. But every vendor has certain things they really do well, and I've tried some new places when looking for certain things lately, so I think I'm going to start giving shout outs to good suppliers. Now, this will certainly not be comprehensive. I'll only write about vendors I've had experience with. And I'm not in the business of flaming people online, so I may only mention those I've had positive experiences with. Actually, apart from a couple eBay sellers and iffy third-party Amazon stores, all the rocketry suppliers I've dealt with so far have been great. It's a small community, and word gets around, so you tend to get really great service. That said, I want this blog to remain positive, so unless I have such a bad experience I feel I must report on it, I'll only talk about the sellers I've gotten good service from. Now if you don't see a certain supplier here, it doesn't mean they're bad. Either I haven't purchased from them, or haven't gotten to writing the post, or maybe haven't even heard of them before. I'm pretty sure I had a few stores bookmarked on my old computer, and lost them when I got a new one. I'm always looking for new sources for rocket stuff - if you have a tip for me, shoot me an email! It's been a busy winter, and Mrs. N00b and I have had a lot on our plates. Consequently, I haven't had as much time to devote to the blog as I used to. While writing this blog isn't my job, and is something I do for fun, I do feel a sense of responsibility to my regular readers. My daily page views have dropped, and it's not surprising - people only show up if you have something to offer. If you're a longtime reader who checks back often to see if there's anything new here, well, thank you for your continued interest, and I think things will pick up this spring. The beginners' series on stability will continue for a few more posts, and in between, I'll have other stuff. Once I'm done with stability, I plan to move on to multistage rockets, clusters (multiple motors side by side - a fun challenge), basic rocket design and building from scratch, and lots of other stuff. But I really need to get through stability before I can move on to that stuff. I can't wait for staging, though. That's going to be a fun one. The finished prototype of Flechette. I can't wait to test this one out - and talk about it here. This is a continuation of a series on model rocket stability for beginners. Click here to go go the beginning of the series. Click here to read the last post. Last time, we discussed the earliest method of finding the Center of Pressure (CP) on a model rocket - the cutout method. This simple method ensured stable flights on every model in the early days of model rocketry. Finding the CP is a crucial problem to solve, because in order for stable rocket flight, the CP must be behind the Center of Gravity (CG). But, of course, the cutout method had drawbacks. Rocketeers had to be reasonably skilled at drawing an accurate representation of the rocket on stiff paper or cardboard, with all the parts in correct proportion. In other words, in order for the cutout method to work the drawing had to look just like the real thing. Since I'm not a skilled draftsman, I cheated a little. I illustrated the cutout method with a design I'd created in OpenRocket - Sounder IB - which I printed on heavy card stock, cut out, and balanced on a piece of aluminum angle. This showed us another drawback of the cutout method - accuracy. While balancing the two-dimensional cutout of Sounder IB did find the center of area for the rocket, that point was far forward of the red CP mark on the drawing itself. 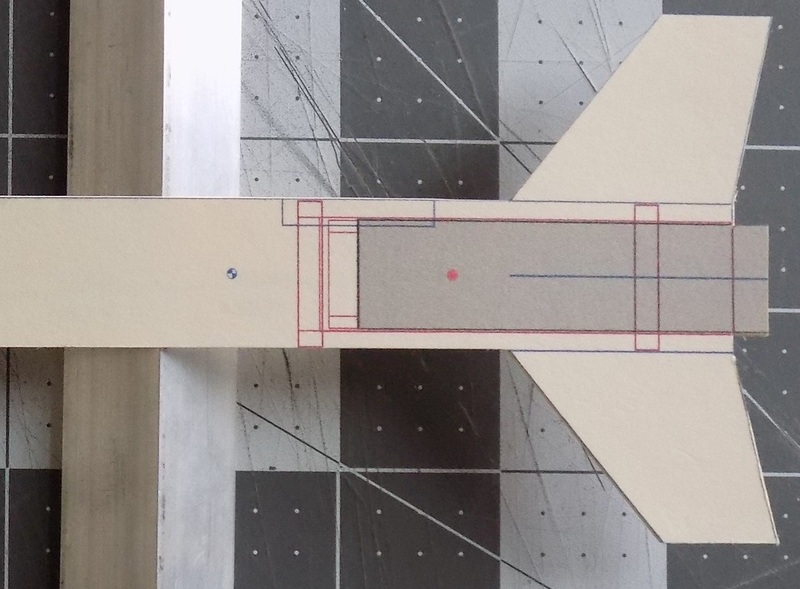 In other words, OpenRocket told me that the CP was in one spot, but the cutout method indicated that the CP was a good two inches further forward. So far, in fact, that the CP as determined by the cutout method was in front of the CG, as calculated by OpenRocket. So, while the OpenRocket design showed the rocket to be perfectly stable, the cutout method showed me a dangerously unstable rocket - one which would flip violently around if it were launched! So, does the cutout method represent the Center of Pressure at all? Or were rocketeers merely fooling themselves? And how do we - how does OpenRocket - know where the CP actually is? Who's right, who's wrong, and why? The answer is that they're both right - kind of. In the cutout method, we're balancing a 2D representation of the rocket - on its side. The cutout is resting on its balance point, so as the force of gravity pulls on it, the force is equally distributed in front of and behind the aluminum angle. This force - gravity - is acting a substitute for another force - air pressure - in the real rocket. So, for the cutout method to represent reality, the air pressure would have to be hitting the rocket directly from the side. The cutout method shows you were the CP would be if the rocket were flying sideways! In this case, that means that all the air is hitting the rocket from the side - at an angle of 90 degrees. The angle the wind is hitting a rocket is known as angle of attack. Alpha represents the angle of attack. Image from Centuri TIR-30, by James Barrowman. 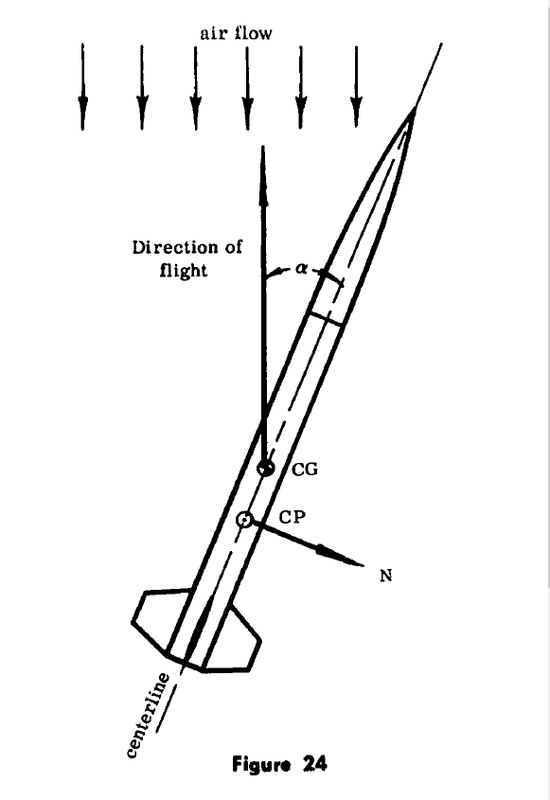 In The Handbook of Model Rocketry, a 90-degree angle of attack is described as "the worst possible flying condition." In fact, it's an imaginary flying condition, because rockets do not fly sideways. They fly pointy end first! Under normal flying conditions, with the proper motor (providing enough thrust for the weight of the rocket), model rockets fly at or near zero degrees angle of attack. While the ambient wind tends to blow horizontally along the ground, the rocket flies fast enough upward that the effect of the wind is minimized. 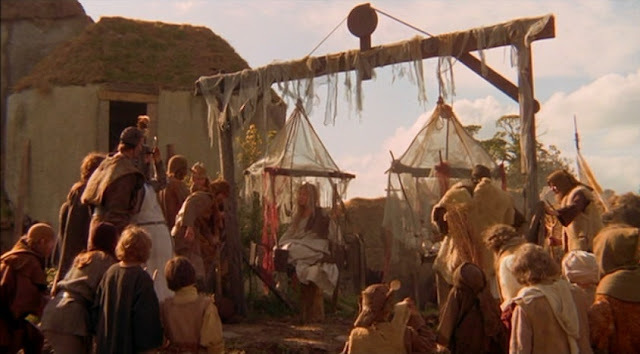 If the wind on launch day is, say, 8 miles per hour, and the rocket is flying upward at, say, 200 miles per hour, the rocket will barely notice the wind coming from the side. Under those conditions, the determination of the Center of Pressure is dominated much more by the fins and nose cone than by the surface area of the body of the rocket. As the rocket wobbles during flight - totally normal for a model rocket - the angle of attack will swing back and forth between zero and a few degrees. As this happens, the fins, which stick out from the body of the rocket, use the oncoming air pressure to correct the rocket's path, causing the back end to rotate away from the wind. The pressure on the body tube at or near zero degrees angle of attach is much lower, and has much less effect on the CP. But if the angle of attack were to suddenly increase significantly, then the air pressure on the nose cone and body tube becomes much more significant. The effect is that, at high angle of attack, the Center of Pressure moves forward. If, due to some (imaginary) catastrophic event in flight, the rocket were to fly sideways, then the CP would move forward enough that it would be where we see it when we do the cutout method. There are only two situations I know of when a normal rocket experiences these conditions. The first is when the rocket is sitting on the launch pad, and the breeze is blowing across the field. But when the rocket is sitting still on the pad, it's not flying, so this doesn't count. The other is a rare, pretty strange event, which I've seen twice - recovery. Once in a while, a rocket will launch, fly to apogee, and then due either to an ejection charge failure or a nose cone which is stuck on too tight, the nose cone doesn't eject. The rocket stays intact, the parachute does not come out, and the rocket begins to fall back to Earth. Normally, when this happens, it's pretty frightening. Because the rocket is stable, with its CG in front of its CP, it will tend to fly nose first. So a rocket which has an ejection failure usually comes in ballistic - taking a nose dive straight at the ground with increasing speed. This usually destroys the rocket. Sometimes, very rarely, an odd thing will happen. The rocket will go up, tip over at apogee, and begin falling back down. In rare instances, the CP at 90 degrees angle of attack will be the same spot as the rocket's CG. The rocket is then neutrally stable. The forces of gravity and air pressure are both centered on the same spot. The rocket descends sideways. Since the Center of Gravity is the point of rotation, and the Center of Pressure is the balance point of the force of the air of the rocket, the whole thing is in balance - just like a balanced scale. Both times this happened, the rocket fell very slowly, and came to a soft landing. Both times, I was filming, but both times, I was so stunned, I missed getting the slowly descending sideways rocket in frame. But it was pretty cool - and certainly a relief not to have the rocket come in ballistic. I should mention that you shouldn't try to replicate this, by gluing on a nose cone or something. It's a chance event when it happens, and the same rocket might not do it twice - a slight difference in Center of Gravity could change everything, and the rocket would come in ballistic. But if you do see it, it's kind of amazing. The fact that the CP can shift forward is really important. It means that the CG and CP could be too close together for the rocket to remain stable. If the angle of attack suddenly increases, due to a gust of wind, or off-center thrust of the motor, or any number of things, having the CG too close to the CP means that under certain circumstances, the CP could move forward of the CG! If these two switch position, you now have a dangerous, unstable rocket. This brings us to the question How far forward of the CP chould the CG be? I was going to save this for a later part of this series, but I think it makes sense to mention it here. In general, the rule of thumb is that the CG should be at least one body tube diameter ahead of the CP. That means that if the rocket is, say, 1 inch in diameter, the CG must be at least 1 inch forward of the CP. This margin is known as caliber, and refers to the diameter of the rocket. Sounder 1B is 0.976 inches or 24.8 millimeters in diameter. If the CG is exactly 0.976 inches or 24.8 mm ahead of the CP, we say the rocket has a stability margin (sometimes called the static margin) of 1 caliber. If the CG and CP are 1.952 inches or 49.6mm apart - twice the diameter of the body tube - the margin is 2 caliber. As you see, Sounder 1B has a static margin of 1.63 caliber. The CG is 40 millimeters forward of the CP. Since the minimum static margin is 1 caliber stability, this is fine. The ideal, especially if you want to fly as high as you can, is a static margin between 1 and 2 caliber. More is usually OK, up to a point. Less is generally not enough for safety, except in the case of some short, stubby rockets. For most model rockets, however, the minimum safe static margin is 1 caliber. 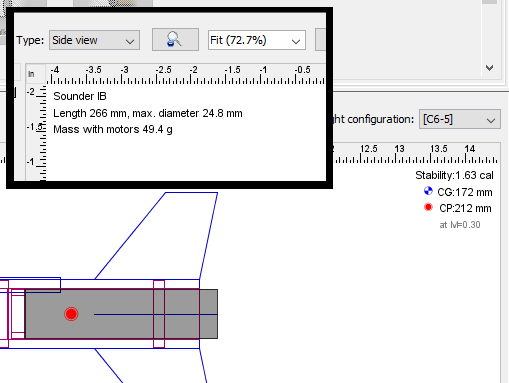 Having a static margin of 1 caliber or more ensures that, even if the rocket encounters a high-degree angle of attack for a moment, the CP isn't likely to shift forward of the CG. The rocket should remain stable. To be clear, the cutout method does work to make stable rockets. But it's what we could call overly conservative with its CP location. A rocket designed using the cutout method would certainly be stable and safe, but it errs so far on the safe side, that you may end up building rockets which are far heavier in the nose cone than they need to be, or with more fins or larger fins than you need. That means you may rob yourself of performance, or you may shy away from building a rocket which is perfectly safe and stable, because you worry it might not be. A better, more accurate method of finding the Center of Pressure was called for. We'll discuss that method in the next post.